When in Rome, tourists regularly trek to see the Berninis. The artist's many sculptures, fountains and St. Peter's Basilica itself are woven into the city—rarely traveling, even if they can. But now Rome has sent an example by this master, often compared to Michelangelo, to the San Francisco Museums of Fine Arts. "Medusa" shows Gian Lorenzo Bernini at his inventive, naturalistic best—and recalls a violent love affair that would have headlined any 17th-century tabloid. He "did this piece for himself, and it's an exercise in bravura to show what he could do," says Bernini scholar Charles Scribner III. Calling it "cathartic," he adds, "I would title it, borrowing from Graham Greene, 'The End of the Affair.' "
In the 1630s, Bernini began a tempestuous affair with Costanza Bonarelli, the wife of an assistant. Around 1636-38, working for the Borghese family, he portrayed her in a tender, lifelike rendering now in the collection of the Bargello Museum in Florence. But their idyll was ruined when Bernini caught his brother Luigi sneaking away from her quarters and exploded with rage. The artist sent his servant to her with orders to slash her face. Thus when Bernini carved "Medusa," he viewed her as the mythical creature, a Gorgon, who had been caught having an affair with Neptune. Medusa is being punished—with her hair transformed into writhing snakes and crying out with anguish. "This is Bernini pushing to the limits what he could do with sculpture," Mr. Scribner says. "The mythical Medusa turned onlookers into stone, and he turns stone into living flesh. That's the quality that made him famous." After the crime, Bonarelli survived, Luigi fled, and Bernini—fined for his offense—was saved by Pope Urban VIII, who arranged for his fine to be waived and urged him to wed. Bernini stayed married and had 11 children, Mr. Scribner says. He appears to have kept his "Medusa" to himself, though. Mr. Scribner says it never appeared in inventories of his work, and it didn't enter the Capitoline Museums until the 18th century, the gift of a marquis. 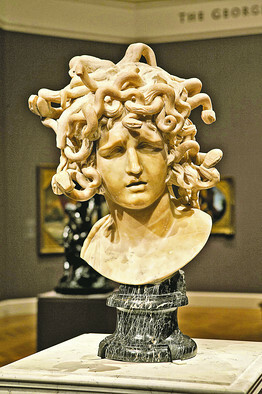 "Medusa," on view at the Legion of Honor branch of the San Francisco museums until Feb. 19, is the second exhibit in a two-year project initiated by Rome's mayor to share masterpieces from the Capitoline Museums. The program, called "The Dream of Rome," began last July with the loan to the National Gallery of Art in Washington of the Capitoline Venus, a copy of a third-century-B.C. Greek statue unearthed in Rome in the 1670s. Pietro Masi, the project's coordinator, says one other deal has been completed: Next summer, the Getty Museum in Los Angeles will borrow "The Lion Who Bites the Horse," circa first to second century. It hasn't been seen in public in 70 years.